One of the good things about a long, 14-hour flight around the North Pole from DC to Beijing, China is that I got the chance to catch-up on some movies that are pretty high in my Netflix queue. Cyrus first, then Dinner With Schmucks (and looking very forward to Grown Ups on my return home in 10 days). 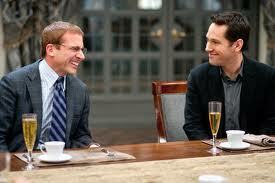 Surprisingly, Steve Carell is the weakness of Dinner With Schmucks. His Rain Man-like character grows tiresome (the movie drags a little painfully), his backstory is close to non-existent (how in the world does someone become such a clueless, unlovable idiot? ), and Carell is amazingly unfunny, sleepwalking through the role. Maybe that’s what becoming a big star and performing in a barrage of movies lately does to comedic geniuses, like with Chevy Chase for example. Anyway, despite Carell, this movie has a good heart and some fine and funny performances. The movie starts off wonderfully as Paul Rudd is his usual easygoing and captivating self as a “stock broker” who wants to marry his girlfriend. When Carell enters the picture (Rudd’s car plows into him while he’s picking up a dead rat in the road to use in one of his historical recreations of human history with dead taxidermied rats), the movie goes a little south. Jemaine Clement from The Flight of the Concords undeniably turns in the movie’s highlight performance as a self-obsessed artist who also happens to be obsessed with goats, in a very existential way. David Walliams, who plays the silly Swiss billionaire being wooed to save the company where Rudd works, is also very funny. I could think of worse ways to spend a flight to Beijing. Like constantly being woken up and bumped by the crazy lady next to me who claimed her foot was hurt and tried to cajole me into switching seats with her. I held strong and kept the aisle instead of the middle.